We had just turned the corner around a nice oak woodlot outside my hometown in northern Indiana, home on a visit for Christmas, when I saw a familiar sight; the prints of a covey of northern bobwhites in the snow. My heart nearly skipped a beat when, as soon as we stopped to investigate the prints, the covey which had temporarily retreated to some nearby shrubby cover, suddenly flushed. Our presence had finally become too much for the birds to bear in their shrubby refuge. It was a welcome sight in northern Indiana where, like across much of Iowa, bobwhite quail numbers have been on a long-term slide because of the loss of suitable winter habitat like the blackberry and raspberry shrubs hiding that covey. It also served as a reminder of all the hidden secrets of the woods and fields revealed by prints in snow; clues acreage owners can seize on to learn about the habits of some of our favorite resident wildlife. Winter habitat for many critters is crucial to their survival and persistence on farms and acreages all across Iowa. For wildlife, winter means long, cold nights, sparse cover to escape predators, and challenges in finding what remains of last summer’s crop of weed, grain, and tree foods. The crops have all been harvested. The trees and shrubs have lost their leaves. The grasses and weeds have died back. Simply stated, winter is a lean time for resident birds like wild turkeys, wild pheasants, and bobwhite quail and other critters like white-tailed deer and cottontail rabbits. Attentive investigation of the habits of our resident wildlife is possible by finding evidence in snow during feeding, loafing, and roosting. As you walk your land this winter, pay close attention to the snow to find tracks left behind during movements from feeding to resting areas or scratchings in the surface of the snow to access preferred food sources like waste grain or acorns. Careful collection of information on the habits of winter residents will yield insights into the types of habitats wildlife need on your land during winter. Evidence of bobwhites or pheasants may be found around shrubby or brushy areas. Tracks of pheasants may be evident going in and out of dense patches of reeds, cattails, or grasses used for safety from predators and refuge from the wind and cold. 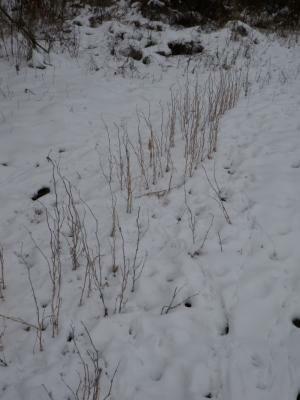 Areas with leftover standing grain crops or weedy areas along field edges and woodlot openings should reveal frequent use. The ground under oak trees with a strong acorn crop will reveal the busy activities of deer, turkeys, and squirrels. All clues to piecing together the puzzle of ideal wildlife habitat on your land that you can consider next summer while on the tractor or planting trees and shrubs. As for what I learned from that covey I was flushed over the holidays? Other than the obvious importance of shrubs from which they erupted, sending my heart into a temporary stand-still, the prints that alerted me to their presence were surrounding a few rows of beans planted too close to the tree line and thus not accessible by the combine during harvest. It served as a simple reminder of the industrious habits of these fascinating birds and the importance of having food above the snow line and near shrubs for bobwhites to survive long winter days.